This evening in early June found me outside with the dogs for their final sniff. It was almost 10 pm and still light enough to see the horses moving slowly through the pasture looking for a hidden blade of grass. The bullfrogs sang their mating serenade in a chorus that was as loud as several tubas tuning for the night’s concert. They were just a dozen or so yards away from where I stood. Any closer and they would have stopped, abruptly, as if one voice, though there must be 50 of them surrounding the pond. It had been an unseasonably warm day; blue sky, green grass and a trail ride through the cool woods nearby. I love this time of year! School will be out soon, too, which means I will get to see more of the kids I love so much. GIVE BIG was a rousing success! We raised a total of $20,142, which was just a touch over our goal of $20,000. I am humbled and over-joyed about the generosity of our beloved supporters. THANK YOU ALL SO VERY MUCH!! Special thanks go out to Art Sandall and Jeff Kirby who both contributed $5000 to the Give Big promotion through their respective resources, but the thanks go to them! It will all go toward our building project this time, as the project costs sky-rocketed over budget when the county’s drainage requirements were finalized. We are still a little short, but I feel confident that we are in very good shape for the building to begin. Blessed by wonderful partners like LRF and great volunteers like Lauren and Carly! David Boker, Ted Robinson, John Dammerell, Ron Harris, Tim, Sandy and Rosy posed for the groundbreaking. Jayne Boker provided food and we had fun imagining what is to come! It will get started soon. All that needs to be done is for the revised drawings to be OK’d by the county. We’re getting close now! Tim, forever supportive and interested in the work we do, is reading The Listening Heart- the book by Leigh Shambo that describes the therapy that we do here at RRR. He was so interested that he wanted to go through the “6 Keys” (the 6 neural circuits that we work on to help heal relationships). While he loves Sport the most and probably always will, he found a new love in Ruby. Each key we work on can call into service a different horse- the one who resonates with you in a strong way in that moment. I have done the Keys myself many times and I am often surprised which horse resonates with me. It is important to listen to your heart. Ruby is the smallest horse on the ranch, besides the minis. She is a beautiful red roan that glistens in the sun like her namesake gem. Red roan is a “ruby red” color that is mixed with white hairs all over her body- with tiny white spots casually thrown in here and there. She is our mustang-always cautious but relentless in her willingness to give her heart away one more time, even though she has been betrayed in her past. No matter; she sought out Tim in his quest for understanding with an open mind and a big heart. As she does for our kids, she was generous with herself in her kindness. She was ready to play, or listen, or wait- whatever Tim needed from her, she delivered. There was a time during one of the sessions that Tim just leaned on her back and allowed the emotions to flow. It was so strong that I could feel it from where I sat, 30 feet away from Tim and Ruby. People often ask me if we need to train the horses to do this work- helping people find a new pathway to healing a broken heart. The answer is no. Horses are so naturally caring and giving. They are generous and relational. Each one brings a different personality to the round pen, but each one brings a desire to be in relationship with the person who is with them. Our minis are acclimating very well. Rufus still worries if he is separated from Rosy, but I will give that as much time as he needs. She is perfectly OK with or without him (maybe he is like an annoying little brother-?) I am now able to have them help in sessions, as long as they are near each other. There are times when one of our kids just needs a “mini chill” time. We have so very many things to be grateful for. I am grateful to all of you for your prayer; donations, support and work that make this ranch run. Our Board is great, our volunteers ROCK and our staff is the BEST. And our horses are beloved. They take on the worries and stress our kids bring here and comfort them selflessly. 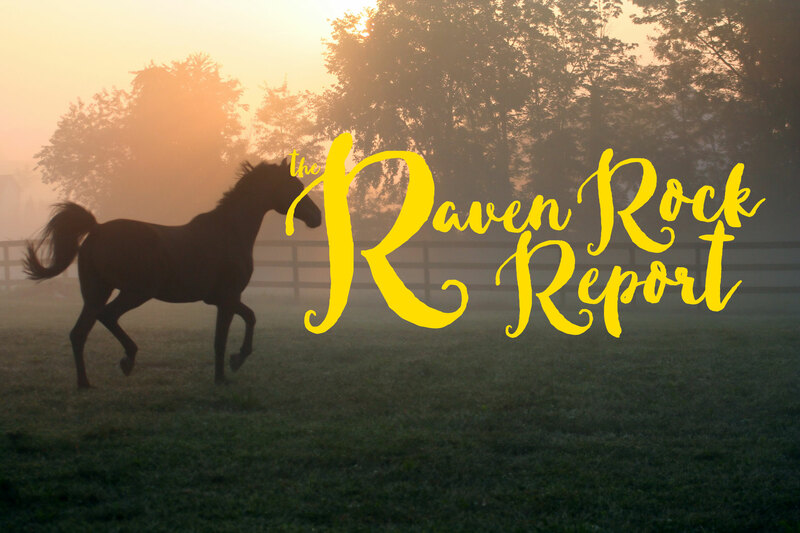 I am humbled and honored to be a part of Raven Rock Ranch! Bergie and I both thank you! !